The world’s stocks of wild fish continue to decline, making the task of finding innovative, sustainable and socially acceptable methods of fisheries management more important than ever. 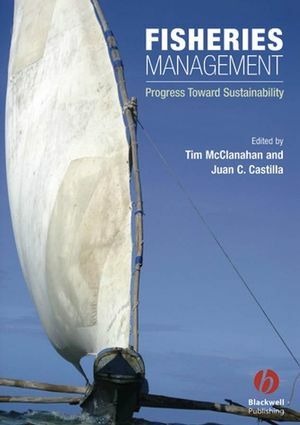 Written by many of the world’s most experienced practitioners Fisheries Management: Progress toward sustainability is an important purchase for all fisheries scientists, managers and conservationists. All libraries in universities and research establishments where this area is studied and taught will find this book a valuable addition to their shelves. Chapter 1. A Brief History of Fisheries Management. O. Defeo, T. McClanahan and J.C. Castilla. The Theory: Assessing and Managing Fisheries Systems. Fishery Research Agenda: Edge Issues for the 21st Century. Spatial Considerations: Closed Areas and Habitat Protection. Reference Points, Fishery Indicators, and the Precautionary Approach. The Limits to Science: When Management Fails. Western Technocratic Models: Abuse and Misuse. The Forgotten Social Side of Management and Attitudes. Institutional Structures, Societal Participatory Roles, and Co-management. II. Small-scale and Artisanal Fisheries. Chapter 2. Successes, Lessons, and Projections from Experience in Marine Benthic Invertebrate Artisanal Fisheries in Chile. Juan C. Castilla, Stefan Gelcich, and O. Defeo. Chapter 3. From Crisis to Institutional Sustainability in the Chilean Sea Urchin Fishery. Carlos Moreno, Alejandro Zuleta, Ana Parma, and Lobo Orensanz. Chilean Fisheries: Political Jurisdiction and Management Institutions. Southern Chile: a Geographic Labyrinth. The Sea Urchin Fishery of Regions X-XI. Historical Trends and Stages in Development. Management and Scientific Advice before 2001. The Dynamics of Depletion and Recovery. A Quest for Alternative Models. Social Turmoil, Political Complexities, and Prospects. Revamping the Monitoring and Knowledge Support. Chapter 4. Achievements and Setbacks in the Commercial Diving Fishery of San José Gulf, Argentine Patagonia. Lobo Orensanz, Ana Parma, Néstor Ciocco and Ana Cinti. The Gulfs of Northern Argentine Patagonia. A Sensitive Region for Marine Conservation. Round 1: Boom and Bust of the San Matías Gulf Scallop Fishery (1968-1972). Round 2: Dredging to Commercial Diving (the 1970s). Round 3: No Controls or Incentives (the 1980s and 1990s). Round 4: Recovery, Participatory Management, and Incentives (2000-2004). Round 5: New Challenges (2005-?). Chapter 5. Evolution and Lessons from Fisheries and Coastal Management in the Philippines. Alan T. White, Edgardo Gomez, Angel C. Alcala, and Garry Russ. Evolution of Coastal and Fisheries Management. Legal and Policy Framework Supporting Decentralization. Contribution of Community-Based Marine Protected Areas. Case I: Supporting Fisheries at Apo and Sumilon Islands. The Role of the Local Community and Local Government. Case 2: Supporting Fisher Livelihood through Tourism at Gilutongan Island, Cebu. Case 3: Supporting Coral Reef Restoration, Hundred Islands National Park, Luzon. Local Governments and Integrated Coastal and Fisheries Management. A Benchmark System for Local Governments. Co-management of MPAs with Local Governments and NGOs. Chapter 6. Redressing Access Inequities and Implementing Formal Management Systems for Marine and Estuarine Subsistence Fisheries in South Africa. Jean M. Harris, George M. Branch, Barry M. Clark, and Sandile C. Sibiya. Finding the Fishers and Fisheries. Implementing Systems for Fisheries Management. Co-management as a Local Management Model. Chapter 7. Collaborative Fisheries Management in Tanga, Northern Tanzania. Sue Wells, Melita Samoilys, Jim Anderson, Hassan Kalombo, and Solomon Makoloweka. Socio-economic Characteristics - the Artisanal Fishery. Review and Re-negotiation of CMAPs. Chapter 8. Management of Area and Gear in Kenyan Coral Reefs. The Biophysical and Economic Environment. The Social-cultural and Legal Environment. History of Fisheries and Gears. History of Marine Protected Areas. Direct Effects of Marine Protected Areas. Indirect Effects of Marine Protected Areas. Effect of Seine-net Removal on Fish Catches. Chapter 9. Progress Towards the Cooperative Management of Marine Hunting in the Great Barrier Reef. The Post-planning Period: 1999 – 2001. Chapter 10. Partnerships towards Sustainable Use of Australia's Northern Prawn Fishery. C. M. Dichmont, N. R. Loneragan, D. T. Brewer, and I. R. Poiner. Coastal Habitats and Prawn Production. The Environment of the Fishery. Sustainability of the Target Species. Prawns are Not the Only Catch. Chapter 11. The Western Rock Lobster Fishery in Western Australia. Bruce F. Phillips, Roy Melville Smith, and Nick Caputi. Reliable Catch, Effort, and Size-frequency Data. Mortality and Damage to Discarded Catch. Communication with Fishers and Stakeholders. Threats to Sustainability in the Future. Regional Contributions to Egg Production. The Effect of Increased Fishing efficiency. Chapter 12. Successes and Challenges in the Hoki Fishery of New Zealand. Mary Livingston and Kevin Sullivan. Life History and Productivity of Hoki. History of the Hoki Fishery. Sustainability of the Hoki Fishery. Future Challenges for the Hoki Fishery. Chapter 13. Community-Based Fisheries in the Canadian Maritimes. Anthony Charles, Arthur Bull, John Kearney, and Chris Milley. Fisheries in the Canadian Maritimes. Examples of Community-Based Fishery Management. Community Management in the Scotia-Fundy Groundfishery. The Fundy Fixed Gear Council. Linkage and Support Mechanisms for Community Fisheries. Centre for Community-Based Resource Management. Orienting Fisheries around Community Needs. T.R. McClanahan and J.C. Castilla. Ecosystems and Cultural Systems are Complex. Need to Save all the Parts, Interactions, and Processes. Assume a Humble and Precautionary Approach. All Permanent Solutions are Holistic Solutions. Change is Part of the System. Holistic Monitoring of Nature, People, and their Compliance. Need for Targets and Thresholds Measures. Fishing and Fisheries Management is a Profession. Incentives, Disincentives, and Certification of People and Fisheries.